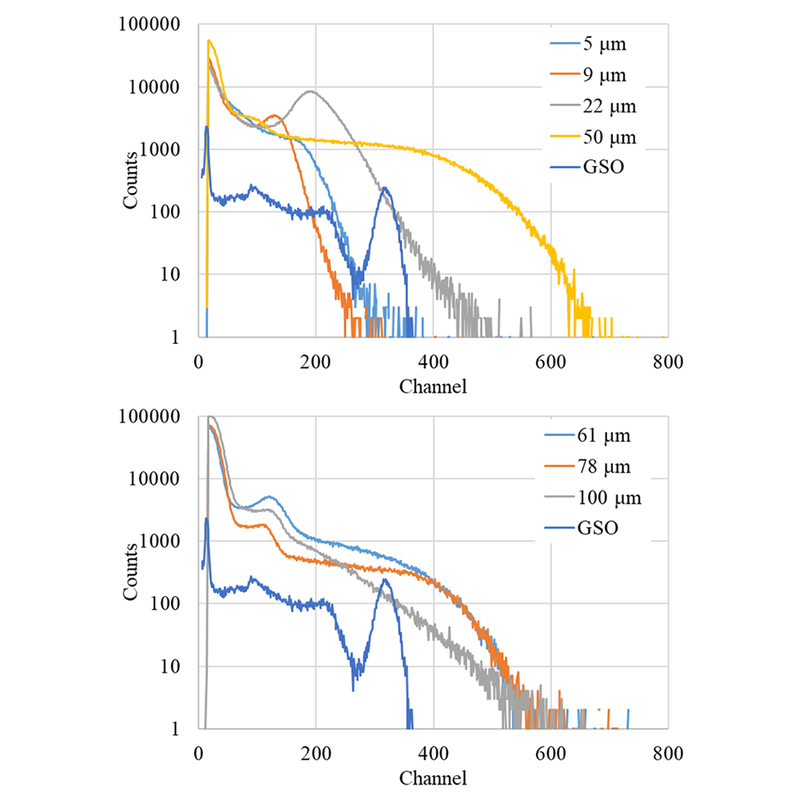 The photoluminescence and scintillation properties of thin-film plastic scintillators of 5–100 µm thicknesses have been analyzed. The photoluminescence and X-ray-induced radioluminescence spectra exhibited a peak at 400–450 nm, which is typical for generic plastic scintillators. As for the radioluminescence spectra, the contribution of the short-wavelength component decreased with the increase in thickness owing to the self-absorption of scintillation photons inside the scintillators themselves. The temporal profiles of scintillation exhibited a fast decay on the order of nanoseconds. The pulse-height spectra of the scintillation detectors equipped with thin-film plastic scintillators were obtained for 5.4 MeV α-rays from 241Am to evaluate the α-ray detection capabilities. Peaks were observed for thin-film plastic scintillators of 9 and 22 µm thicknesses, and their light yields were estimated to be 830 and 410 photons/MeV, respectively. The dependence of pulse height spectra on film thickness indicates that self-absorption occurs in such thin films.